A fracture is a break in a bone, which occurs when force greater than the bearable limit is applied against a bone. A fracture in the hand may occur on or just below the knuckle, in the middle or base of a bone, or near the wrist. 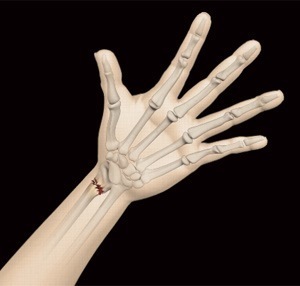 A fracture in the hand may sometimes involve the displacement of the bones from their normal position. The most common symptoms of any fracture include severe pain, swelling, bruising, and discoloration of the skin, bleeding, deformity and limited mobility of the hand. Fractures in the hand may lead to a shortened finger, depressed knuckle or the crossing-over of a finger over its neighbour when you make a partial fist. The diagnosis of a hand or finger fracture is based on your history, physical examination and X-ray imaging to determine the type and severity of the fracture. The objective of early fracture management is to control bleeding, provide pain relief, prevent ischemic injury (bone death) and remove sources of infection such as foreign bodies and dead tissue. The next step in fracture management is the reduction of the fracture and its maintenance by either non-operative or surgical methods. The bones can be realigned by manipulating them into place (closed reduction). Following this, splints, casts or braces are used to immobilize the bones until they heal. The cast is usually worn for 3 to 6 weeks. Fractures may take several weeks to months to heal completely. You should limit your activities even after the removal of the cast or brace so that the bone becomes solid enough to bear stress. A rehabilitation program involves exercises and gradual increase in activity levels to strengthen the muscles and improve range of motion.